Much like the soil food web, an aquatic version based around an Perma-Aquaculture system is an interrelated system based on predator prey relationships with photosynthesis adding a primary energy source. Its starts with primary producers, those using photosynthesis to build the base of the web. Varying niches are filled within the water and around the banks. Some float, some are rooted, some break the water’s surface and some do a combination of two. 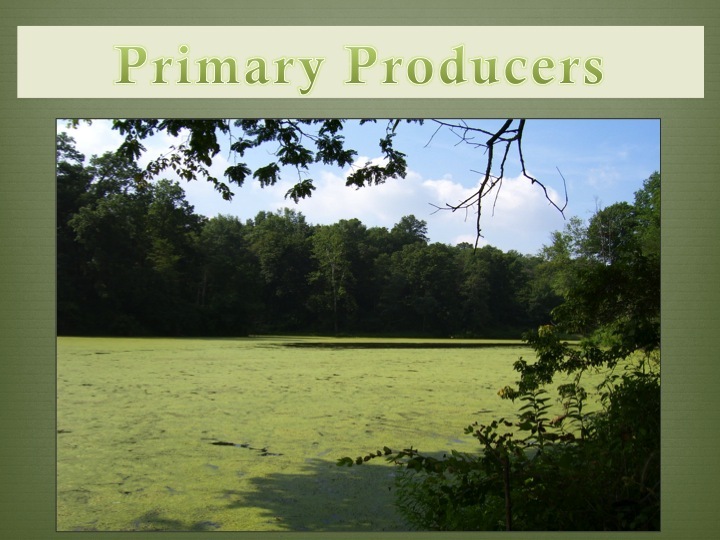 From there we must also consider the smallest of the primary producers in the pond called phytoplankton and algae. These are micro in size and suspended in the water column. Their presence, especially in high numbers, gives the body a green or red tint or color depending on the species and water. These plants are supported by terrestrial vegetation as well because no Permaculture aquaculture system would be complete without beneficial interactions. 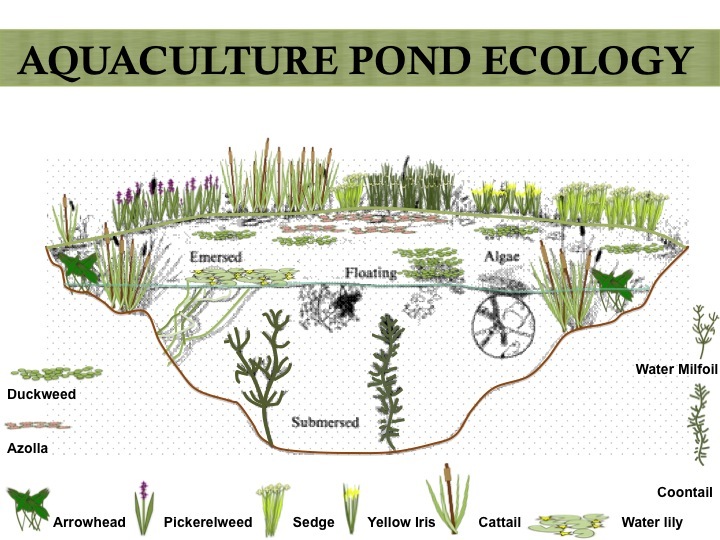 Hence the aquatic system benefits the land and vice versa. 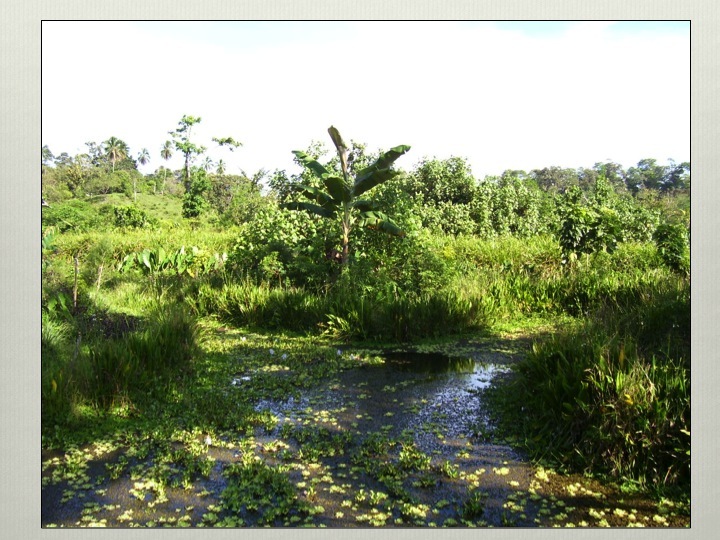 The land based plants can provide food directly such as the leaves of cassava for tilapia or fringing grasses for carp, but also can be prepared into a homemade fish food. This comes from combining grain and fruits to make our own pellet feed. From here life turns to death as this cycle is inevitable. This creates the basis or decomposition again both on land or at the pond bottom. 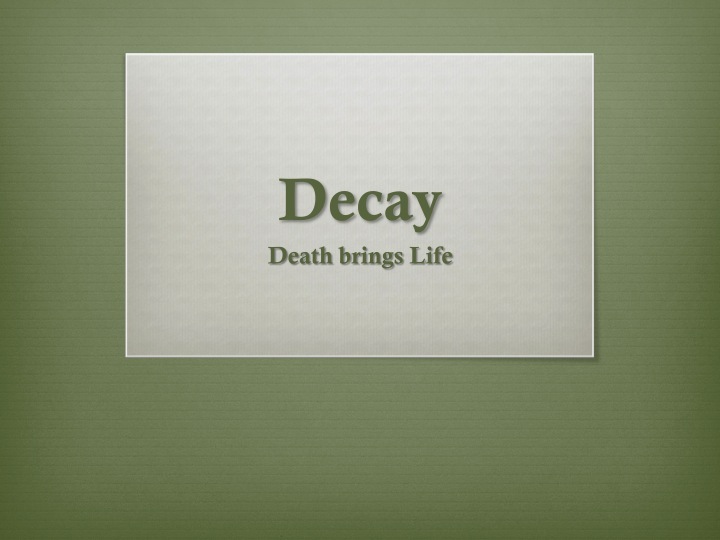 When it is at the bottom it is called detritus where the breakdown process occurs and organic material develops. This begins the nutrient cycling just as composting on land would occur. 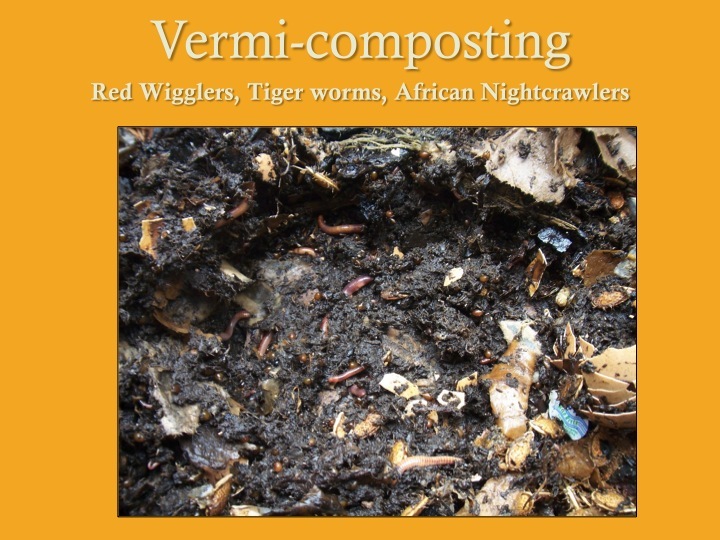 The main characters that bring this decomposition and nutrient cycling is similar to a compost pile. However in aquatic systems they are Bacterial driven unlike a forest system that is dominated by fungal counts. Bacteria are abundant in numbers and through their eating and reproducing they consume vast amounts of oxygen in a limited oxygen environment. This is why we simply can’t dump vast quantities of fertilizers into the water. Furthermore this is why algae blooms due to fertilizer or animal waste runoff is so destructive to the aquatic system. What happens is the overabundance of nutrients allows algae or other aquatic plants to flourish but with their life comes death and the decay process. So the bacteria populations explode due to the organic matter input and over-consume oxygen causing system failure known as fish kills. pathogens in water. Also are the benthic invertebrates which live on the pond bottom. They breakdown leaves and other organic material that land in the pond’s bottom. Also breakdown organisms in our systems include land based ones as again our interactions must bring land into the system. So worms and maggots can be grown as waste decomposers and then fed to the fish and ducks. 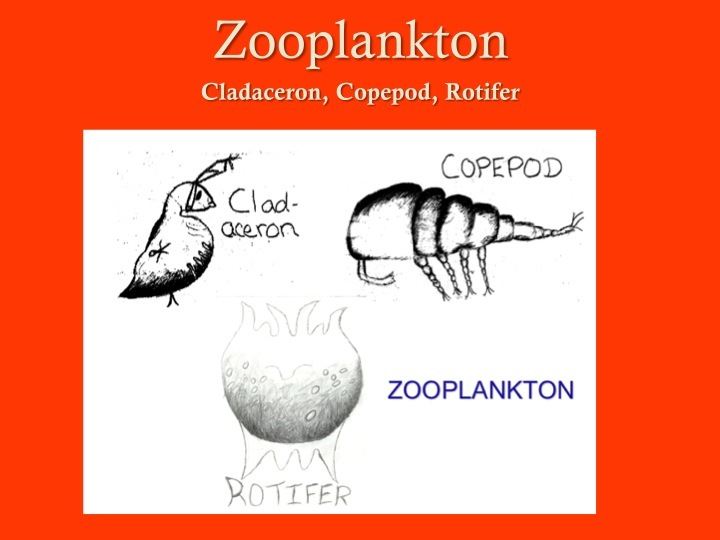 then are feed on by Zooplankton. Just as the cow is eaten by other predators such as mountain lions or humans, zoo plankton form the main feed base for you fish. They are a high protein source and give the young fish the energy they need to put on growth quickly so they move out of danger size. In this web, the connector of many of the elements are the adult fish which in this case is Tilapia. They are omnivores and have a broad range of foods. They don’t eat other fish in general and are a great selection for aquaculture. It is through sensible stimulation of the primary producers that we can grow fish more quickly in our Perma-aquaculture systems. Adding chicken manure or incorporating ducks into the system can really benefit the overall organism. its important to have a balance though as we don’t want the system failure of lack of oxygen. There are ways to infuse oxygen into the system mechanically and biologically. A careful examination of water quality is really important in this context. Our design of systems ties into our species selection and these water quality parameters that can be limiting factor in water. the clarity of the water, its temperature, and its oxygen quality all have an effect. Are you growing Tilapia or trout, the two are totally different ecosystem you will be mimicking ad require good design to perpetuate either without consuming more calories than you put in. Remember aquaculture can be 4-20 more productive than our land based systems and we need to design it to make it 20 instead of 4.